The earliest surviving candles originated in Han China around 200 BC, and were made from whale fat. European candles of antiquity were made from various forms of natural fat, tallow, and wax. In Ancient Rome, candles were made of tallow due to the prohibitive cost of beeswax. It is possible that they also existed in Ancient Greece, but imprecise terminology makes it difficult to determine. In the Middle Ages in Europe, tallow candles were the most common candle. By the 13th century, candle making had become a guild craft in England and France. The candle makers (chandlers) went from house to house making candles from the kitchen fats saved for that purpose, or made and sold their own candles from small candle shops. Beeswax, compared to animal-based tallow, burned cleanly, without smoky flame. Rather than the foul and terrible odor of tallow, it emits a fresh smell. Beeswax candles were expensive, and relatively few people could afford to burn them in their homes in medieval Europe. However, they were widely used for church ceremonies. In the 18th century, spermaceti, oil produced by the sperm whale, was used to produce a superior candle. Late in the 18th century, colza oil and rapeseed oil came into use as much cheaper substitutes. The manufacture of candles became an industrialized mass market in the mid 19th century. In 1834, Joseph Morgan, a pewterer from Manchester, England, patented a machine that revolutionised candle making. It allowed for continuous production of molded candles by using a cylinder with a moveable piston to eject candles as they solidified. This more efficient mechanized production produced about 1,500 candles per hour. This allowed candles to become an easily affordable commodity for the masses. Candlemakers also began to fashion wicks out of tightly braided (rather than simply twisted) strands of cotton. This technique makes wicks curl over as they burn, maintaining the height of the wick and therefore the flame. Because much of the excess wick is incinerated, these are referred to as "self-trimming" or "self-consuming" wicks. In the mid-1850s, James Young succeeded in distilling paraffin wax from coal and oil shales at Bathgate in West Lothian and developed a commercially viable method of production. 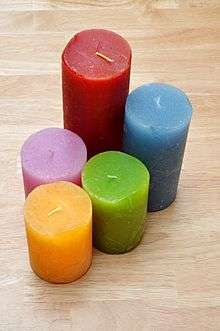 Paraffin could be used to make inexpensive candles of high quality. It was a bluish-white wax, burned cleanly, and left no unpleasant odor, unlike tallow candles. By the end of the 19th century, most candles being manufactured consisted of paraffin wax and stearic acid. By the late 19th century, Price's Candles, based in London, was the largest candle manufacturer in the world. Founded by William Wilson in 1830, the company pioneered the implementation of the technique of steam distillation, and was thus able to manufacture candles from a wide range of raw materials, including skin fat, bone fat, fish oil and industrial greases. Despite advances in candle making, the candle industry declined rapidly upon the introduction of superior methods of lighting, including kerosene and lamps and the 1879 invention of the incandescent light bulb. From this point on, candles came to be marketed as more of a decorative item. 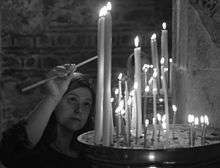 Candle lighting in the Visoki Dečani monastery. Before the invention of electric lighting, candles and oil lamps were commonly used for illumination. In areas without electricity, they are still used routinely. Until the 20th century, candles were more common in northern Europe. In southern Europe and the Mediterranean, oil lamps predominated. In the developed world today, candles are used mainly for their aesthetic value and scent, particularly to set a soft, warm, or romantic ambiance, for emergency lighting during electrical power failures, and for religious or ritual purposes. With the fairly consistent and measurable burning of a candle, a common use of candles was to tell the time. The candle designed for this purpose might have time measurements, usually in hours, marked along the wax. The Song dynasty in China (960–1279) used candle clocks. By the 18th century, candle clocks were being made with weights set into the sides of the candle. As the candle melted, the weights fell off and made a noise as they fell into a bowl. In the days leading to Christmas some people burn a candle a set amount to represent each day, as marked on the candle. The type of candle used in this way is called the Advent candle, although this term is also used to refer to a candle that decorates an Advent wreath. The hydrocarbon C31H64 is a typical component of paraffin wax, from which most modern candles are produced. 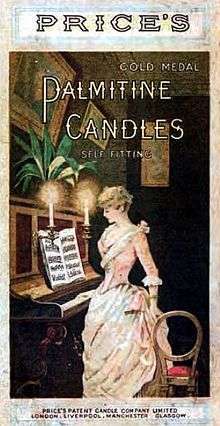 For most of recorded history candles were tallow (a by-product of beef-fat rendering) and beeswax until the mid 1800s at which point they were made mainly from spermaceti (spurring larger demand for whale oil), and stearin (initially manufactured from animal fats but now produced almost exclusively from palm waxes). Today, most candles are made from paraffin wax, a product of petroleum refining. The size of the flame and corresponding rate of burning is controlled largely by the candle wick. Production methods utilize extrusion moulding. More traditional production methods entail melting the solid fuel by the controlled application of heat. The liquid is then poured into a mould or a wick is repeatedly immersed in the liquid to create a dipped tapered candle. Often fragrance oils, essential oils or aniline-based dye is added. A candle wick works by capillary action, drawing ("wicking") the melted wax or fuel up to the flame. When the liquid fuel reaches the flame, it vaporizes and combusts. The candle wick influences how the candle burns. Important characteristics of the wick include diameter, stiffness, fire-resistance, and tethering. A candle wick is a piece of string or cord that holds the flame of a candle. Commercial wicks are made from braided cotton. The wick's capillarity determines the rate at which the melted hydrocarbon is conveyed to the flame. If the capillarity is too great, the molten wax streams down the side of the candle. Wicks are often infused with a variety of chemicals to modify their burning characteristics. For example, it is usually desirable that the wick not glow after the flame is extinguished. Typical agents are ammonium nitrate and ammonium sulfate. Based on measurements of a taper-type, paraffin wax candle, a modern candle typically burns at a steady rate of about 0.1 g/min, releasing heat at roughly 80 W. The light produced is about 13 lumens, for a luminous efficacy of about 0.16 lumens per watt (luminous efficacy of a source) – almost a hundred times lower than an incandescent light bulb. The luminous intensity of a typical candle is approximately one candela. The SI unit, candela, was in fact based on an older unit called the candlepower, which represented the luminous intensity emitted by a candle made to particular specifications (a "standard candle"). The modern unit is defined in a more precise and repeatable way, but was chosen such that a candle's luminous intensity is still about one candela. The hottest part of the flame is just above the very dull blue part to one side of the flame, at the base. At this point, the flame is about 1,400 °C. However note that this part of the flame is very small and releases little heat energy. The blue color is due to chemiluminescence, while the visible yellow color is due to radiative emission from hot soot particles. The soot is formed through a series of complex chemical reactions, leading from the fuel molecule through molecular growth, until multi-carbon ring compounds are formed. The thermal structure of a flame is complex, hundreds of degrees over very short distances leading to extremely steep temperature gradients. On average, the flame temperature is about 1,000 °C. The color temperature is approximately 1,000 K.
A candle flame is formed because wax vaporizes on burning. It has three distinct regions. The innermost zone, directly above the wick, contains wax that has been vaporized but that is unburnt. It is the darkest zone. The middle zone is yellow and luminous. As it is an oxygen depleted zone, insufficient oxygen exists to burn all of the wax vapor. As such, partial combustion of wax takes place. The zone also contains unburnt carbon vapor. The temperature in this region is hotter than the innermost zone, but cooler than the outer zone. The outer zone is the area where the flame is the hottest and complete combustion of wax takes place. It is light blue in color and not normally visible. The main determinant of the height of a candle flame is the diameter of the wick. This is evidenced in tealights where the wick is very thin and the flame, which is for mainly decorative purposes, is very small. Candles whose main purpose is illumination use a much thicker wick. One of Michael Faraday's significant works was The Chemical History of a Candle, where he gives an in-depth analysis of the evolutionary development, workings and science of candles. According to the U.S. National Fire Protection Association, candles are one of the leading sources of residential fires in the U.S. with almost 10% of civilian injuries and 6% of civilian fatalities from fire attributed to candles. A candle flame that is longer than its laminar smoke point will emit soot. Proper wick trimming will substantially reduce soot emissions from most candles. The liquid wax is hot and can cause skin burns, but the amount and temperature are generally rather limited and the burns are seldom serious. The best way to avoid getting burned from splashed wax is to use a candle snuffer instead of blowing on the flame. A candle snuffer is usually a small metal cup on the end of a long handle. Placing the snuffer over the flame cuts off the oxygen supply. Snuffers were common in the home when candles were the main source of lighting before electric lights were available. Ornate snuffers, often combined with a taper for lighting, are still found in those churches which regularly use large candles. A former worry regarding the safety of candles was that a lead core was used in the wicks to keep them upright in container candles. Without a stiff core, the wicks of a container candle could sag and drown in the deep wax pool. Concerns rose that the lead in these wicks would vaporize during the burning process, releasing lead vapors — a known health and developmental hazard. Lead core wicks have not been common since the 1970s. Today, most metal-cored wicks use zinc or a zinc alloy, which has become the industry standard. Wicks made from specially treated paper and cotton are also available. 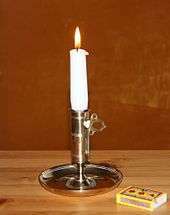 Decorative candleholders, especially those shaped as a pedestal, are called candlesticks; if multiple candle tapers are held, the term candelabrum is also used. The root form of chandelier is from the word for candle, but now usually refers to an electric fixture. The word chandelier is sometimes now used to describe a hanging fixture designed to hold multiple tapers. Many candle holders use a friction-tight socket to keep the candle upright. In this case, a candle that is slightly too wide will not fit in the holder, and a candle that is slightly too narrow will wobble. Candles that are too big can be trimmed to fit with a knife; candles that are too small can be fitted with aluminium foil. Traditionally, the candle and candle holders were made in the same place, so they were appropriately sized, but international trade has combined the modern candle with existing holders, which makes the ill-fitting candle more common. This friction tight socket is only needed for the federals and the tapers. For tea light candles, there are a variety of candle holders, including small glass holders and elaborate multi-candle stands. The same is true for votives. Wall sconces are available for tea light and votive candles. 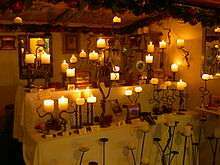 For pillar-type candles, the assortment of candle holders is broad. A fireproof plate, such as a glass plate or small mirror, is a candle holder for a pillar-style candle. A pedestal of any kind, with the appropriate-sized fireproof top, is another option. A large glass bowl with a large flat bottom and tall mostly vertical curved sides is called a hurricane. The pillar-style candle is placed at the bottom center of the hurricane. A hurricane on a pedestal is sometimes sold as a unit. A bobèche is a drip-catching ring, which may also be affixed to a candle holder, or used independently of one. Bobèches can range from ornate metal or glass, to simple plastic, cardboard, or wax paper. Use of paper or plastic bobèches is common at events where candles are distributed to a crowd or audience, such as Christmas carolers or people at other concerts/festivals. And sometimes to shield the flame from wind. Candle followers are often found in churches on altar candles. Candle snuffers are instruments used to extinguish burning candles by smothering the flame with a small metal cup that is suspended from a long handle, and thus depriving it of oxygen. An older meaning refers to a scissor-like tool used to trim the wick of a candle. With skill, this could be done without extinguishing the flame. The instrument now known as a candle snuffer was formerly called an "extinguisher" or "douter". ↑ "chandelier". The Free Dictionary By Farlex. Retrieved 2012-05-19. ↑ European Candle Association FAQ. ↑ "Candle". The Free Dictionary By Farlex. Retrieved 2012-05-19. 1 2 Forbes, R J (1955). Studies in Ancient technology. pp. 139–140. ISBN 9789004006263. Retrieved 7 November 2014. ↑ "History of candles". National Candle Association. Archived from the original on May 17, 2012. Retrieved 2012-05-19. ↑ "history of candle". national candle association. ↑ Shillito, M. Larry; David J. De Marle (1992). Value: Its Measurement, Design, and Management. Wiley-IEEE. p. 33. ISBN 0-471-52738-6. ↑ Phillips, Gordon (1999). Seven Centuries of Light: The Tallow Chandlers Company. Book Production Consultants plc. p. 74. ISBN 1-85757-064-2. ↑ Golan, Tal (2004). Laws of Men and Laws of Nature: The History of Scientific Expert Testimony in England and America. Harvard University Press. pp. 89–91. ISBN 0-674-01286-0. ↑ Geoff Marshall (2013). London's Industrial Heritage. The History Press. ↑ Ball, Michael; David Sunderland (2001). An Economic History of London, 1800-1914. Routledge. pp. 131–132. ISBN 0-415-24691-1. ↑ Whitrow, G. J. (1989). Time in History: Views of Time from Prehistory to the Present Day. Oxford University Press. pp. 90–91. ISBN 0-19-285211-6. Archived from the original on June 10, 2015. ↑ Geddes, Gordon; Jane Griffiths. Christianity. Heinemann. p. 89. ISBN 0-435-30693-6. ↑ "Using stearic acid or stearin in candlemaking". happynews.com. Retrieved 25 September 2014. ↑ "Stearic acid (stearin)". howtomakecandles.info. Retrieved 25 September 2014. ↑ Camp, William R.; Vollenweider, Jeffrey L.; Schutz, Wendy J. (12 October 1999). "Scented candle gel". United States Patent 5,964,905. ↑ Hamins, Anthony; Bundy, Matthew; Dillon, Scott E. (November 2005). "Characterization of Candle Flames" (PDF). Journal of Fire Protection Engineering. 15: 277. doi:10.1177/1042391505053163. ↑ On Fire – Background Essay, PBS LearningMedia, WGBH. Retrieved April 8, 2015. ↑ National Council of Educational Research and Training. "Science: Textbook for Class VIII". Publication Department, 2010, p.72. ↑ Sunderland, P.B. ; Quintiere, J.G. ; Tabaka, G.A. ; Lian, D.; Chiu, C.-W. (6 October 2010). "Analysis and measurement of candle flame shapes" (PDF). Proceedings of the Combustion Institute. 33: 2489–2496. Retrieved 2015-02-10. ↑ "Internet History Sourcebooks". Fordham.edu. Retrieved 2012-12-25. ↑ John Hall, NFPA 2009, "Archived copy" (PDF). Archived from the original on 2013-05-13. Retrieved 2013-01-27. /PDF/Research/Fire_overview_2009.pdf. ↑ K.M. Allan, J.R. Kaminski, J.C. Bertrand, J. Head, Peter B. Sunderland, Laminar Smoke Points of Wax Candles, Combustion Science and Technology 181 (2009) 800–811. Wikisource has the text of the 1913 Catholic Encyclopedia article Candles.